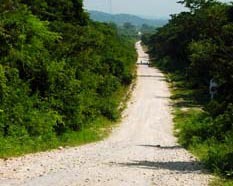 An assortment of road projects has been proposed in the border region of Mexico, Guatemala and Belize, which is part of the Maya Forest, the largest contiguous tropical forest in the Americas north of the Amazon. The proposals are apparently aimed at spurring economic growth and reducing the high levels of poverty found in this area. But more and better roads usually bring more people and expand farms. Decision-makers are therefore confronted with a seeming conflict between conservation and development goals. Would new roads be bad or good for the Maya Forest region? To help answer that question, CSF worked with Trópico Verde, the Wildlife Conservation Society (WCS), Unidos para la Conservación, ProNatura Peninsula de Yucatán and Duke University to analyze the economic and environmental impacts of proposed road investments. Economic returns to Guatemala and Mexico were calculated for two projects that would join the two countries through currently roadless forest of the Maya Biosphere Reserve. Deforestation, habitat fragmentation and forest fire were projected for a larger set of projects. We used two separate models to predict these impacts, one focused on just Guatemala’s Maya Biosphere Reserve, and the other looking at a larger, three-country area. We discovered that all new road proposals would result in economic losses for Guatemala and most would have the same outcome for Mexico (none of the roads directly threatens Belize). In addition, the research team discovered that the roads would substantially increase the incidence of forest fires and accelerate deforestation. At a regional level, six large areas of jaguar habitat would be sliced into 16 separate fragments, complicating survival for these wide-ranging predators. CSF's partners at WSC, Trópico Verde, Unidos para la Conservación and ProNatura Peninsula de Yucatán presented these results widely in Guatemala and Mexico and have so far succeeded in preventing construction of the most environmentally threatening roads.